Jurors are the gods of guilt in Mickey Haller’s world. They decree the fate of the accused. As this story opens, Haller feels as if his personal jurors have tried him in the balance and found him wanting. When his daughter’s friend is killed by a drunk driver—a client of Haller’s—she cuts off all contact with him. His burgeoning relationship with his ex-wife implodes. And he loses the election for Los Angeles district attorney. When a murder case comes his way, Haller takes it. (What else is he supposed to do?) What begins as a relationship with paying client quickly becomes a desperate attempt to clear a wrongly accused man, get justice for a dead friend (who happens to be his client’s alleged victim, and put the real killer on the stand. 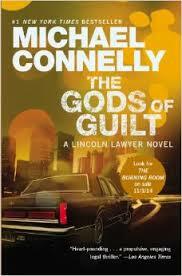 The Gods of Guilt is not the best novel in the Lincoln Lawyer series. That’s a bit like saying someone’s the second tallest starter on an NBA team, however. Michael Connelly is a great mystery writer, and I turned the pages on this one like I have on the previous ones—just not as fast. Still, this novel goes deeper in the psyche of Mickey Haller, giving us a window on his hopes and dreams, as well as his doubts and failures. What the story lacks in narrative punch, compared to the other novels, it makes up for in emotional pathos. The reader feels sorry for the downturn in Haller’s personal life, even as it cheers him on in the courtroom.